The unilateral replacement for Mystery Flare Dragon is the 4th card of the week. Chronos Command Dragon has a simpler to execute and much more fun ability. First, you Stride him, tossing a Grade 3 most of the time, and what's the reward as well as 26k base (mostly) and Triple Drive? When he hits, you Counterblast 2 and Soulblast 1 and toss a card in the hand to send EVERY rear-guard the opponent has to the bottom of the deck. This is a lot better. Needing less damage to execute it can mount pressure faster than Mystery Flare and is a lot easier to pull off. And now for some bad news. This is not a subtle card and it will more often than not just be met with a Perfect Guard to the face because LOL NO the opponent will never let you Counterblast 2 for a board wipe worth up to 5 cards. What's more, in order for Chronos Command to be cost effective it would have to wipe out 3 rear-guards at least with its skill. -1 from the hand and +3 in advantage means a Counterblast-to-card of 1:1. I wouldn't really call it that great even then since Steam Fighter Amber + Chronojet Dragon can net pretty much the same advantage ratio on one turn. If the opponent is foolish enough to call a large field and their hand dwindles however, this is the perfect way to punish them. Just don't expect to play any mind games with him. 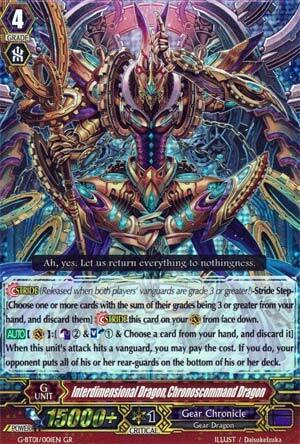 Oh, hey Vector Prime, when did you join Vanguard? According to the Lore, CCD here was the first to open a time gate to connect the past to the present. Anyway, what we have here is a G-unit that, if you hit your opponent's vanguard, allows you to CB2 and SB1 and discard a card from your hand to send all of your opponent's rear guards to the bottom of their deck. ...Yeeouch! Basically it's Nouvelle Vague or Blaster Joker, but as a Gear Chronicle. Utterly crippling your opponent's field for a pittance cost. Seriously, Bushi, what are you smoking when you come up with some of these cards. Still not as bad as tomorrow's card. Oh, and just so everyone knows, if you didn't figure it out, this is a staple for Gear Chronicle for awhile now.